Learning can be fun. Heck, let’s just get straight to the point and state unequivocally that learning should be fun, dammit! Learning through play is also a powerfully effective way for people of all ages to acquire and accumulate new concepts and practices. Current neuroscience suggests that using a variety of approaches to concretize ideas and create new neural networks through a variety of sensory engagements is the best way to for people to learn. Take a moment to go read Mark Levison’s InfoQ article “Learning: Best Approaches for Your Brain” for an introduction to neuroplasticity — it’s a fascinating topic. 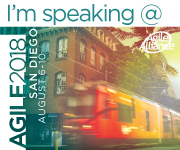 As an Agile trainer (and in my never-ending experience as a student of Agile), I find that the most memorable elements of the typical 2 day Agile workshop are the games and exercises. Games like the Penny Game, Mr. Happy Face, and the Multitasking Exercise help people take in new and challenging ideas in a playful context. I’ve also observed that time spent playing in the workplace, whether participating in a structured game in a training course or informal kibitzing around the team dartboard/foosball table/Carcassonne board, repays the organization in fostering more fruitful and successful working relationships. When pressed to get a new-to-Agile team ramped up quickly to work on a new endeavour, I’ve sometimes been tempted to replace the fun stuff with exercises designed around the team’s actual work (and some students have suggested this in workshop retrospectives). My principal reservation is that as soon as you use real work as a basis for trying on a new idea, the focus is firmly placed on a successful outcome rather than exploring and experimenting with the idea and potentially failing in the process. Since the presentation to Agile Ottawa in June, I’ve learned a few new games at AgileCoachCampCanada and joined the new Agile Games Google Group, which is a fantastic resource. I’d love to know what your favourite game for teaching is – leave a comment and share your experiences as a teacher/trainer or a student!